The ocean is rocked by storms and its tides ebb with the moon. Waves eat away at the shore, rearranging the sand and bringing cliff-side structures crashing into the surf. It doesn't behave like water in a bathtub. But for simplicity’s sake (and because scientists are still learning about how climate change will melt glaciers), researchers have generally projected sea level rise as if the ocean will remain still and calm as it creeps up on crucial infrastructure and seaside neighborhoods. A new study from the U.S. Geological Survey says the predicted damage from sea level rise in California triples once tides, storms and erosion are taken into account. “There are many communities that are planning by only considering this in a bathtub and not considering the fact that that’ll be on top of these episodic storm events that'll cause most of the short term impacts,” said the study’s lead author, Patrick Barnard, a USGS coastal geologist based in Santa Cruz. The study showed that, once these variables are taken into account, more than $150 billion worth of property and infrastructure and about 600,000 coastal residents could be flooded by the end of the century. 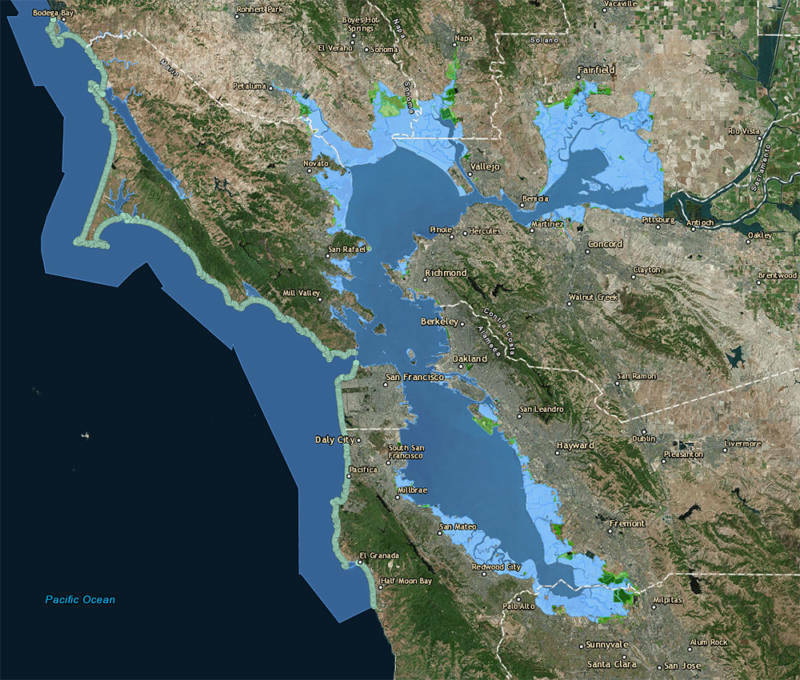 About two-thirds of that property and those lives at risk are in and around the San Francisco Bay, said Barnard, who is the research director of the Climate Impacts and Coastal Processes Team at USGS. When the team's mathematical models factored in the variability of the tides, beach and cliff erosion, and once-in-decades storms, the predictions for coastal communities in a warming world got grim and wet. The locations threatened by flooding are the usual suspects: Foster City, Pacifica, and the San Francisco International Airport. Southern California will also be hit hard, with the ports of Los Angeles and Long Beach inundated and whole neighborhoods in Orange County under water during big storms and high tides. To bring it home for planners and the public, the study included an interactive online mapping tool with multiple layers representing different scenarios: a king tide, interventions to shore up beaches and wetlands, and various levels of sea rise. Users can look up their neighborhoods, their commutes, their favorite beaches or the port where their latest online order entered the U.S. Most scenarios quickly put SFO under water. Others flood marinas and homes in Foster City. Highway 101 along the Peninsula gets very wet when sea level rise and storms combine. The goal of this imagery is “to make it accessible to high-level policy people by translating the physical impacts into the socioeconomic impacts,” Barnard said. The effects of climate change are already apparent every winter, he said. For example, Highway 37 in Marin County just reopened after a levee broke during last month’s storms. “Maybe that happens once a winter every five years or something. In the future, we're going to see — instead of once or every five years —it's going to happen every year,” he said. After a couple of decades, that flooding will likely happen five times per year, then 20 times per year, Barnard said. Eventually, winter storms will send seawater creeping into areas that have never seen flooding before. Molly Peterson contributed to this report.